RNC chairman warns Dems against choking "on the bone of responsibility"
(CNN) -- House Speaker Nancy Pelosi on Wednesday called on President-elect Barack Obama to govern from the middle, as her party sat poised to gain its widest House majority in 15 years. 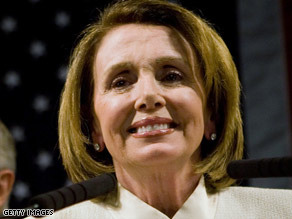 House Speaker Nancy Pelosi, D-California, celebrates election victories Tuesday night in Washington. According to projections, Democrats in the House were on track Wednesday to increase their majority by at least 18 seats, a margin that would give Obama a formidable tool to push his legislative agenda after his January 20 inauguration. Democrats took at least 22 seats from Republicans in Tuesday's election, with the GOP taking four seats from the Democrats, according to CNN projections. With winners yet to be called for eight of the House's 435 seats, Democrats were projected to win 254 seats, with Republicans having 173. "I don't know what the final number will be," Pelosi said during a Wednesday afternoon news conference on Capitol Hill. "But it will be well over 250. It's a signal of the change that the American people want." Pelosi, D-California, said she hoped Obama would "bring people together to reach consensus" on issues that concern Americans. "A new president must govern from the middle," she said. Topping her agenda, she said, would be "growing the economy, expanding health care, ending dependence on foreign oil and ending the war in Iraq." When he woke up Wednesday morning, Republican National Committee Chairman Mike Duncan said, he felt like the boy who stubbed his toe, the character in a quote from President Lincoln, who said: "It hurts too bad to laugh, and I'm too big to cry." Duncan also called on the president-elect to govern from the center and warned that if Democrats moved too far to the left, Republicans could take back seats in the 2010 midterm elections. "The last two times Democrats controlled the House, Senate and the presidency, they choked on the bone of responsibility," he said. "They lurched far to the left and introduced the country to President Ronald Reagan and Speaker Newt Gingrich." Among Tuesday's GOP casualties was longtime Rep. Chris Shays of Connecticut, whose reputation for occasionally bucking his party couldn't keep him from losing to Democrat Jim Himes. Heading into Election Day, the Democrats had a 235-199 House majority. The Democrats' gains come two years after they took control of the House -- with a gain of 30 seats -- after 12 years in the minority. Democrats gained at least two seats in Ohio, including that of Rep. Steve Chabot, who was seeking an eighth term in a Cincinnati-area district that normally votes about evenly for GOP and Democratic presidential candidates. CNN projects that Chabot lost to Democrat Steve Driehaus. Just two years earlier, Chabot was re-elected with 52 percent of the vote despite an anti-Republican tide that helped Democrats capture Ohio's governorship and take a U.S. Senate seat. Democrats also gained a seat left open by retiring Rep. Ralph Regula. Democrat John Boccieri defeated the GOP's Kirk Schuring in the northeastern Ohio contest. • In New York, Democrats won three Republican seats, including two left open by incumbents not seeking re-election. In one of the open races, Democrat Mike McMahon won the last GOP-held seat in New York City, defeating the GOP's Robert Straniere. Democrat Dan Maffei defeated Republican Dale Sweetland, who was trying to win a seat vacated by 10-term GOP Rep. Jim Walsh. In a rematch of a 2006 race, former naval officer Eric Massa beat GOP Rep. Randy Kuhl in a western New York district that generally votes Republican. • Freshman Rep. Michele Bachmann, R-Minnesota, was projected to survive a race that tightened after she accused Obama of having "anti-American views." She was leading Democratic challenger Elwyn Tinklenberg 47 percent to 43 percent with 86 percent of precincts reporting. Bachmann set off a storm of criticism in October when she said Obama's connection to 1960s radical William Ayers made her concerned that Obama may have anti-American views. Bachmann's comments prompted a flood of fundraising for Tinklenberg. • In Florida, Democrats captured from Republicans two of the four seats that analysts thought they could win. Democrat Suzanne Kosmas defeated Rep. Tom Fenney, and Democrat Alan Grayson defeated Rep. Ric Keller. However, brothers and Republicans Lincoln Diaz-Balart and Mario Diaz-Balart, who represent districts in southern Florida, held off their Democratic challengers. Lincoln Diaz-Balart won a ninth term, defeating former Hialeah Mayor Raul Martinez. • Democratic incumbents weren't invulnerable in Florida. Rep. Tim Mahoney -- a south-central Florida Democrat elected to replace scandal-plagued GOP Rep. Mark Foley in 2006 -- lost to his Republican challenger, Tom Rooney. Mahoney already was going to have a tough race in his Republican-leaning district. But the race became tougher in mid-October with allegations that Mahoney had an affair with one of his aides and paid her thousands of dollars in hush money. Mahoney admitted to causing "pain" in his marriage, but he denied paying the aide to keep quiet. • Republican incumbents in two California districts maintained their House seats -- Rep. Ken Calvert defeated Democrat Bill Hedrick, a former teacher, and Brian Bilbray defeated Democrat Nicholas "Nick" Alexander Leibham, an attorney. In June 2006, Bilbray narrowly won a special election to fill the vacant San Diego seat that once was occupied by disgraced former Rep. Randy "Duke" Cunningham. • In Pennsylvania, Rep. John Murtha handily defeated Republican challenger William Russell. Republicans had hoped to defeat Murtha after he called his western Pennsylvania district "a racist area" and "redneck." • The House's third-ranking Republican, Rep. Adam Putnam of central Florida, was re-elected but wrote to his colleagues Tuesday night that he wouldn't run again for a leadership post, saying he wanted to return his focus "to crafting public policy solutions for America's generational challenges." He is currently the GOP conference chairman. • In a heavily Republican district near Houston, Texas, Democratic Rep. Nick Lampson lost his re-election bid against Pete Olson. Lampson won the seat in 2006 after Republican and former House Majority Leader Tom DeLay resigned to fight state money laundering charges. • In Ohio's 11th District, Democrats easily took a seat that was vacant since the death of Democratic Rep. Stephanie Tubbs Jones. Democrat Marcia Fudge defeated Republican Thomas Pekarek. Tubbs Jones, who represented the district that covers parts of Cleveland and its suburbs, died in August after brain hemorrhaging caused by an aneurysm. • The House's first two Muslim members, Rep. Keith Ellison of Minnesota and Rep. Andre Carson of Indiana, won their contests Tuesday. Carson has won his first full term; he had succeeded his grandmother, the late Rep. Julia Carson, in a March special election. • There was a party change in the race to represent New Jersey in the House. Democrat John Adler, 48, defeated Republican Chris Myers, 42, a Navy combat veteran. Adler, an attorney, sponsored New Jersey's 2006 law prohibiting smoking in indoor public places and workplaces. He was also the sponsor of a law toughening car emission standards in the state. • Democrats took power from Republicans in Idaho, too. Walt Minnick beat Republican William Sali in a race for the House. Minnick has an MBA and law degree from Harvard University and served as a Nixon White House staffer in the early 1970s before starting a 21-year career at a wood-products maker. Not all 435 seats will be decided immediately. Two Louisiana districts used Election Day for primary runoffs; the general election for those seats will be December 6.